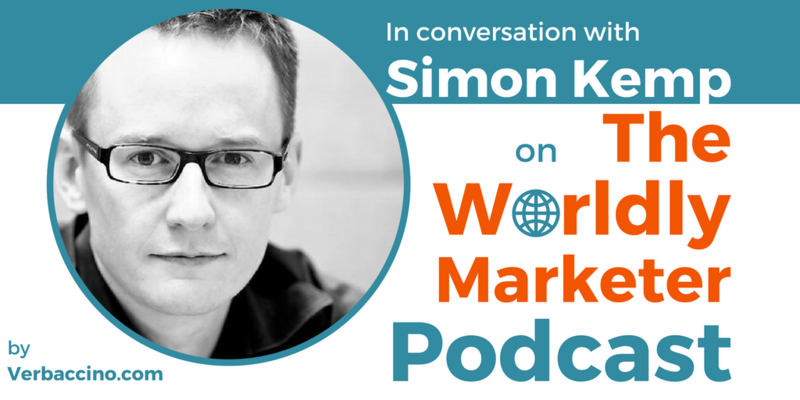 It’s a pleasure to welcome Simon Kemp back to The Worldly Marketer Podcast. He has been on the show twice before: on episodes #022 (Why Marketing In Asia Is All About Cultural Intelligence) and #048 (What You Need to Know About Global Digital Usage in 2017). Originally from Scotland, Simon has been living in Singapore for over a decade. He is the Head of Kepios, a global marketing consultancy that helps brands make sense of the future. He’s also the creator of the well known Global Digital Reports, which he publishes annually and updates quarterly in collaboration with Hootsuite and WeAreSocial. Simon’s much-anticipated reports are available for free via the Kepios website and on SlideShare. They provide marketers and business owners with a detailed and up-to-date snapshot of how people all around the world are using the Internet in general and social media in particular. They represent an invaluable resource for anyone planning an international marketing strategy. Catch Simon’s latest insights from the 2018 data. You can even follow along via the linked SlideShare presentations, below. And if you have any questions for Simon, feel free to send them along via the Verbaccino Contact page! I’ll be happy to have Simon back on the show to answer your questions on a future episode.